Beer #10 of the Portland BeerPlow, though it's actually from Idaho, and I'm back in San Diego. 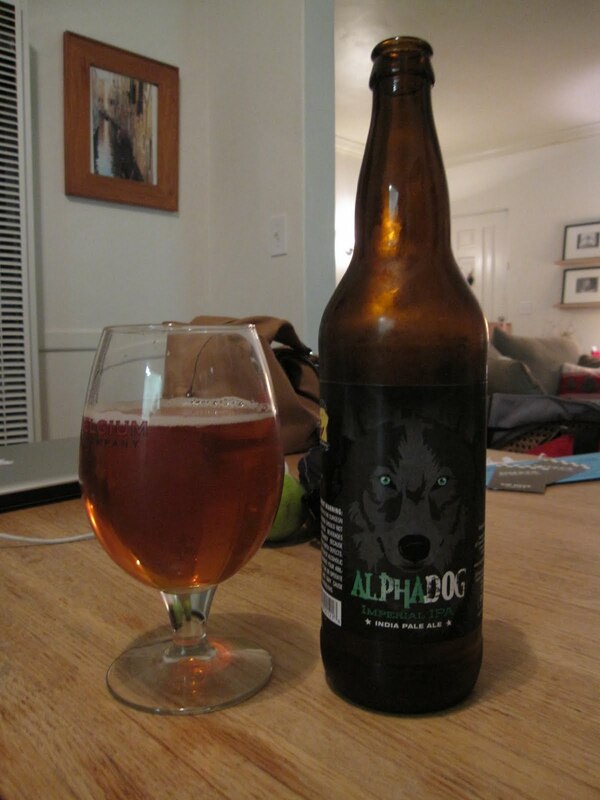 I'll give Laughing Dog credit- the name is clever (for the unaware, alpha acids are what give hops bitter flavor). This one claims to be 127 IBU, which I believe is the highest IBU I've ever sampled...although I'm also aware that such a number is a bit of a marketing gimmick because the scale saturates at 100. Anyway, after most of the other Portland IPAs, I'm a bit wary of amber-colored IPAs, especially imperials. They tend to be extremely malt-heavy, and super malty IPAs are not my bag. And when you kick it up to imperials, the maltiness can transition to cloying sweetness. So I admit I wasn't expecting much when I poured it. It has a very sweet, musty malt nose with just a dash of florality. So the malt dominates the nose, but hopefully not the flavor, but...yup, it's too sweet. The problem here, as with the previous Silver Moon Hoptagon, Speakeasy's Double Daddy and dozens of other IIPAs, is that the sweetness of the malt completely obscures all of the complexity the hops offer, leaving them unable to add anything beyond basic bitterness. There are appealing qualities to this beer- the malt by itself could produce a decent brown ale- but I can't help but feel like this is a mistreatment of hops. Folks, you can't just dump a shitload of hops into a sugar bomb. I realize the IIPA hops/malt balance is a difficult proposition, but this just isn't the way to solve it.